Alex A. Blum was born in Budapest, Hungary, on February 7, 1889. Blum’s birthplace and birth date were found on his application and petition for naturalization, and his World War I and II draft cards. Who’s Who of American Comic Books 1928–1999 said his name was Alexander Anthony Blum. According to Classics Illustrated: A Cultural History (2001), his birth name was Sándor Aladár. At night he studied at the National Academy of Design, winning a scholarship after a few months. While a student there he was awarded a bronze medal in a city-wide etching competition and first prize in the National Academy show in 1909. The New York Herald, May 15, 1909, named the prize: “Etching Class—First prize, A.H. Baldwin Fund, $50, Alexander Aladar Blum”. Two years earlier, the New York Tribune, May 11, 1907, reported Blum’s Suydam bronze medal for illustration at the academy. According to the American Art Annual, Volume 29 (1932), Blum was a pupil of Frank Duveneck and Charles F.W. Mielatz. The 1910 U.S. Federal Census recorded Blum (as “Alex A.”), his mother and siblings in Manhattan, New York City at 500 West 172 Street. He was a newspaper artist. At some point he moved to Boston, Massachusetts, where he filed his Declaration of Intention with the Naturalization Service district office. He lived at 40 Huntington Avenue when he signed the form as “Aladar Blum” on April 18, 1913. In the 1915 New York State Census, “Alex Blum” resided with his mother and brother in Brooklyn New York at 2060 83rd Street. The Brooklyn Daily Eagle (New York), October 21, 1915, published a glowing review of his work. Alex Aladar Blum of 2060 Eighty-third street, Brooklyn, is showing until November 6 in the Print Gallery, above Ehrlch’s, on Fifth avenue, Manhattan, about two score etchings, this being his first exhibition in Greater New York. He is only 26 years old, and yet his works exhibit both the delicacy and strength of men far older than he. Moreover he shows that he is open to tho most modern influences, such as those of the French school, instanced by Matisse, although he taboos the ultra tendencies of that school. The collection is singularly interesting, in that it shows Mr. Blum’s development in various phases of the art of etching. While he is master of expressive drawing and modeling, he evinces, especially in his latest work, a gift for suggesting light and color and rhythm, in the latter using the slightest means for producing large results. More than mere cleverness is revealed in the “Rhythm of line; a sequence,” as he terms nine examples. In them he gives a feeling as of music, and all by the use of the line. Perhaps the most beautiful in the nine etchings is “The Wave,” lines in a cure of grace passing across the picture and, in various well composed attitudes, accompanying the wave is a number of nudes. “The Comet” is also striking, with nudes posed as though mounting upward in a curved course, while effect in opposition is given by lines curved in the background. In the same category are “Nudes,” “The Lake,” “Mother and Child,” a peculiarly interesting composition; “Bathers,” “Hills and Lake,” “The Castles" and “The Dance,” in which the interfering line of the main motive has a stimulant effect to the eye. Mr. Blum was born in Cincinnati, Ohio [sic], in 1889, and after visiting Europe he returned to the art school in his native city. Later he was a pupil at the National Academy of Design, where he won first prize for etching and a bronze medal for drawing. For a time he taught at the Boston Art School. The Herald Statesman told of the next major event in his life. Working on a newspaper during the day, Mr. Blum did some oil painting and etching before becoming involved with a theater group. He designed a stage set for one production and at the theater he met an attractive costume designer. “We were co-workers, both young, and—you know—one thing led to another.” Mr. Blum married the former Helen Abrahams in 1917. A marriage notice appeared in the Philadelphia Inquirer, January 3, 1917: “Aladar Blum, an artist, of Brooklyn, N.Y., was granted a marriage license to wed Helen Abrahams, of 3119 Diamond street. Blum is 37 and his intended bride 30. Miss Abrahams’ father is a manufacturer.” On January 17, 1917, Blum and Helen Abrahams married in Philadelphia, Pennsylvania, according to her profile in Who’s Who in American Jewry (1926) and Jewish Women in America (1997). On May 6, Blum signed his World War I draft card, which had his name as Aladar and Manhattan address at 12 West 8th Street. The artist’s description was tall, medium build with brown eyes and black hair. Blum illustrated two books by Mary Hazelton Wade: The Boy Who Dared: The Story of William Penn (1929) and The Boy Who Loved the Sea: The Story of Captain James Cook (1931). In the 1930 census, Blum was an artist and remained in Philadelphia but at a different address, 3303 West Queen Lane. New to the family was a son, Robert. Sometime before 1935, the Blums moved to New York City. According to Who’s Who of American Comic Books, around 1938 Blum joined the studio formed by Will Eisner and Jerry Iger. The Catalog of Copyright Entries, Part 1, Books, Group 2, Pamphlets, etc., 1936, New Series, Volume 33, Number 8, has an entry for Oddities of the News by Dic “Lacalzo”, which was a misspelling of Loscalzo. Loscalzo produced a limited number of strips that were signed Dic. Editor & Publisher yearbooks credit “Alex Boon” in 1937, “Al Boon” in 1939 and “Al Blum” in 1942 for the remaining Oddities strips. Who’s Who of American Comic Books credits Blum on the strip, Oddities in [sic] the News, and said “Alex Boon” was a pen name. I believe Blum produced the Oddities strips after Loscalzo’s departure. Then early in the depression, when, as he says, “things were awkward for artists”, Mr. Blum became art director of Classic Magazine, a position he held until after World War II. Blum signed his World War II draft card April 26, 1945. His address did not change and employer was “Iger Eisner, 204 East 44”. Blum referred to the partners even though Eisner and Iger had parted ways in 1939. 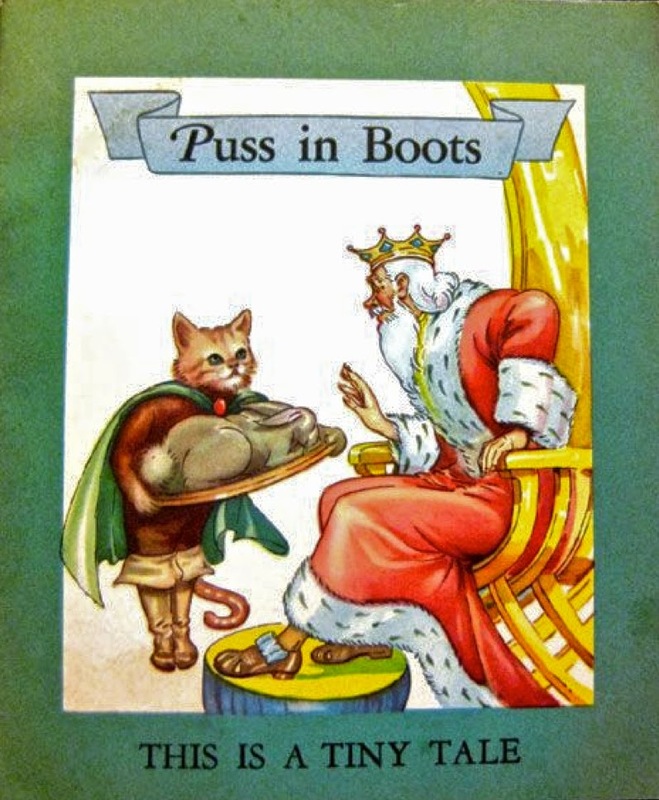 In 1946, Blum illustrated a version of Puss in Boots by Ruth A. Roche, who worked in Jerry Iger’s studio. Blum was one of several artists who worked on the Illustrated Classics series which was published in newspapers. Blum’s Alice in Wonderland was serialized in four parts with each part consisting of four full-pages. Each page held the equivalent of four comic book pages, so the adaptation was a total of 63 pages of art plus a page about the author. 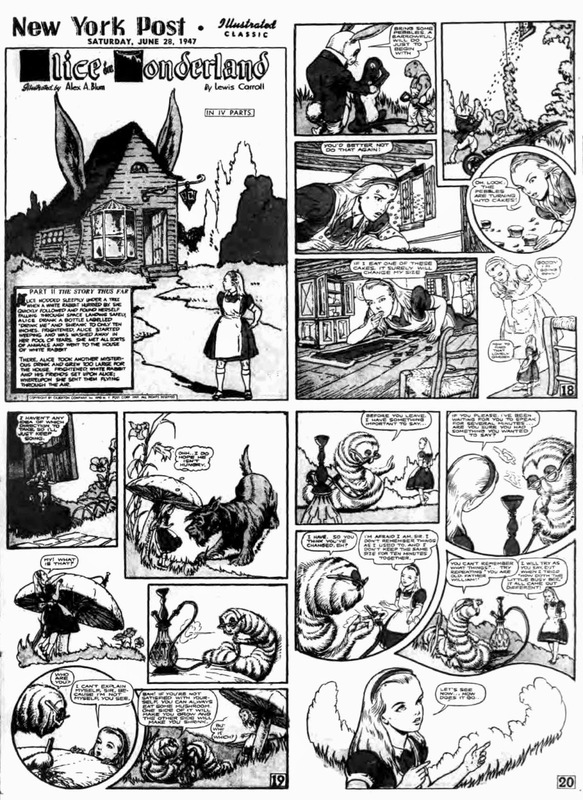 The New York Post published its weekend color comics on Saturday; Alice appeared on June 21 and 28, and July 5 and 12, 1947. The comic book version used 44 of the 64 pages. Classics Illustrated: A Cultural History has a chapter devoted to Blum, “Alex A. Blum: ‘A Prince of a Man’”. Blum’s comic book career ended around 1961; many of his comic book credits are here. The Herald Statesman said Blum and his wife moved to Rye, New York in 1946. They bought a 275-year-old barn (287 Rye Beach Avenue) and converted it into their home and studio. The artists held informal art classes starting in the mid-1950s. Who’s Who in American Art (1953) had an entry for Blum. Blum, Alex A.— Etcher, P.
287 Rye Beach Ave., Rye, N.Y.
B. Budapest, Hungary. Feb. 7, 1889. Studied: NAD; Cincinnati A. Acad. Awards: prize. NAD. 1924. Work: MMA; LC; Yale Univ. ; BMFA; Weslcyan Col.
Blum passed away September 5, 1969. His death was reported in the Rye Chronicle (New York), September 11. Alexander Blum, 80, a noted artist, of 287 Rye Beach Ave., died on Friday at United Hospital. Mr. Blum, was born in Budapest Feb. 7, 1889, the son of the late Alexander, and Rose Blum. He moved to Cincinnati with his family before he was 10. He had won three prizes in art by the time he was 13 and attended the Cincinnati Art Academy. He moved to New York and became a reporter on the old New York World and attended the National Academy of Design at night. In Boston he continued as a daytime reporter and did free lance etching at night. He and his wife the former Miss Helen Abrahams, moved to Great Neck, Long Island where the artist became art director of Classic Magazine until after World War II. Mr. and Mrs. Blum moved to Rye 23 years ago in order that the artist might paint in quiet, scenic surroundings. In addition to his wife, Mr. Blum is survived by a daughter, Mrs. Audrey Bossert of Pleasantville; a son, Robert Blum of Deerfield, Ill.; five grandchildren and a sister, Mrs. Hedwig Bleier of New York.